Brand: Alpha Vac System Inc. It is the most recommend type of table top vacuum packaging machines whereas it's not too big not too small but just the right size and packing speed for butcher shops, restaurants, super markets, and small processors. Our Mini45LR comes with double seal bar with 17.1" (435mm) seal bar length and 15.4" (380mm) seal bar distance you can fit with wide range packing size. 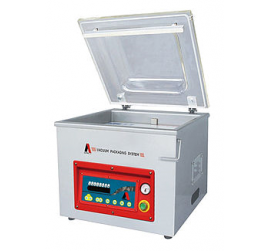 All of Alpha Vac vacuum packaging machines are equipped with IP65 washdown grade digital controller and overload relay electrical protector. This machine has two seal bar to double packing output. ​All of Alpha vac vacuum packaging machine are equipped with a digital 20 program controller which allows our customers to save a wide range product parameter compared to a traditional analogue timer controller which is needed to adjust every time a different product is packed. With a transparent vacuum lid you can easily check your packing status.